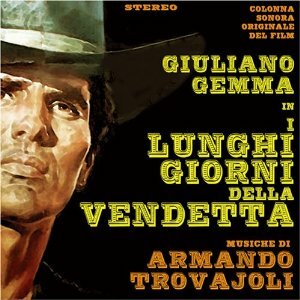 The 409th Soundtrack of the Week takes us back to the spaghetti western with Armando Trovajoli's score for I Lunghi Giorni della Vendetta. It sounds like you'd expect. Strummed acoustic guitar, electric guitar with reverb and lots of attack. The occasional harmonica. Sweeping themes on the trumpet. In other words it's an example of the subgenre of soundtrack music for which Ennio Morricone is famous. Trovajoli comes up with some melodies and atmospheres all his own, however, such as the eerie, organ-drone cue for "Dopo Il Duello Part 2". And "Vai, Cow-Boy, Vai" could have made the garage/surf instrumental circuit if the movie had been better known. The CD does include a "Japanese single version" of the main theme, a very Morricone-like rouser with galloping percussion and soaring electric guitar and trumpet. Fans of this sort of thing will love this.